Many scientists have flaunted the idea that drinking small amounts of alcohol is beneficial to our hearts. Moderate drinking can also sharpen our minds as we grow older and lessens our risk of developing diabetes. In fact dietary guidelines allow one to two drinks daily. That is why it is important to understand how alcohol affects our health. 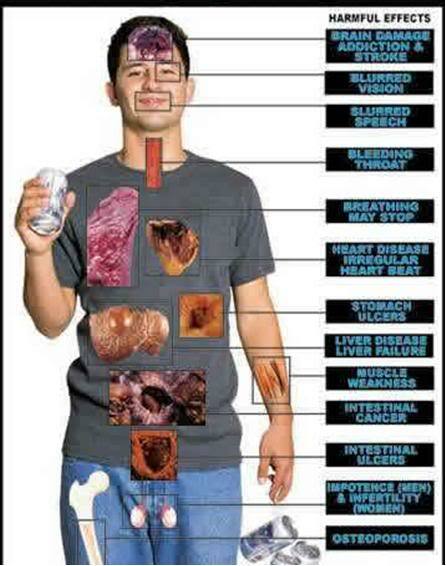 Drinking can be good for your health, but it can also be harmful. It all depends on the amount of your alcohol intake, your age and other factors. We all know that drinking too much of it can lead to serious problems. The most minimal amount of alcohol has an effect on our bodies. The alcohol you take in is absorbed into the bloodstreams and distributed to all part of your body. It exits through your urine and your breath. Alcohol absorption is lessened when you eat, especially if you eat fatty food. But if you drink alcohol more than what your body can process, you get drunk. If you have been taking alcohol for a long time, you are jeopardizing your health and putting your life in anger. Excretory System – Excessive alcohol makes the pancreas produce toxic substances and will disrupt proper functioning. It will result to pancreatitis, an inflammation of the pancreas and damage it. Once damaged, no more digestive enzymes will be produced to help the gallbladder digest the food. Insulin and glucose in your body will not be regulated anymore. The liver will also inflame causing jaundice and may complicate to liver hepatitis. Central Nervous system – Alcohol abuse causes the frontal lobes of the brain to shrink. Your ability to think clearly will be affected, as well as the ability to form memories. You become forgetful. It will be harder to talk that is why when you have too much of it, your speech is slurred, a sign that you are already drunk. Digestive system – Excessive alcohol injures parts of the digestive tract causing stomach ulcers and gastritis. It can lead to internal bleeding and more seriously, colon cancer. Circulatory System – Heavy drinking can damage your heart. It poisons the muscle cells of the heart. You will experience irregular heartbeat and high blood pressure, which will lead to stroke and heart attack. Sexual and Reproductive System – Excessive drinking can cause erectile dysfunction and impede hormone production in men. It can cause infertility for women. It increases her risk for premature delivery, stillbirth and miscarriage.